Very Good. 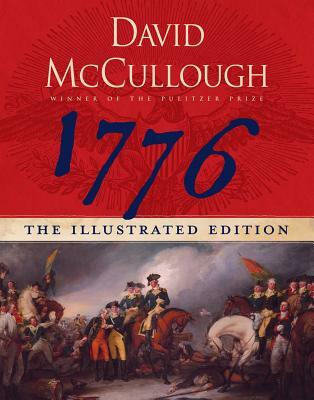 1776 by Mccullough, David, 2006-07-04. Trade paperback (US). Glued binding. 386 p. Contains: Unspecified. Good. 1776 by Mccullough, David. Trade paperback (US). Glued binding. 386 p. Contains: Unspecified. Very Good. 1776 by McCullough, David, 2005-05-24. Sewn binding. Cloth over boards. 400 p. Contains: Unspecified. Good. 1776 by McCullough, David. Sewn binding. Cloth over boards. 400 p. Contains: Unspecified. Good in Very Good jacket. Ex-Library. 8vo-over 7¾"-9¾" tall. US reprint, large 8vo, 386pp, photo illustrations; ex US Air Base library copy with stamps, labels and some selotape to boards; these delights aside VG+ Copy in VG+ DJ. I was overwhelmed by the beautiful photos, and the added replicas of historic documents. A must for any history buff. Received this book in great condition. The book is a must read for History buffs. I found the reading very easy and was able to follow the characters from beginning to end without losing sight of their part in history. Great! I like the book. It was great! I'll let other people know that the book was great during the Revolutionary War. Though I studied the American Revolution in school, this history brought a human feeling to the brave American men like Washington, Knox and others who had seemed so remote before. I live in Brooklyn, and I learned a lot about battles that took place near my home. I highly recommend 1776. This is probably one of the most important and most misunderstood years in the history of our country. As always, McCullough tells a great story packed with information. If you're interested in the early years of America, this is a must read.